West Kirby United Reformed Church, Meols Drive, West Kirby, Wirral, CH48 5DA. Services take place every Sunday at 10.30am and 6.15pm and everyone's welcome. Find out more here. 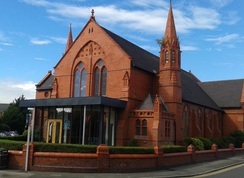 ​West Kirby URC is the red-brick church situated at the corner of Meols Drive and Bridge Road, near Aldi. A number of buses stop immediately opposite the church, and West Kirby's main bus stops and train station are located a few minutes walk away. If you have an urgent need, please contact the Minister, Rev Louise Franklin, on 0151 625 3998. If you have a question, comment or an enquiry about one of our groups or events, please complete the contact form below. This will be sent to the Church Office and then forwarded to the person best placed to answer your question. If you would like to enquire about hiring a room at West Kirby URC, please contact our halls bookings secretary, Edward Owen, directly on 0151 632 3045 or by email to edward_owen@btinternet.com. ​To help Edward to respond to your enquiry, please include in any initial email or answerphone message the nature of your proposed activity, the specific room or hall wanted (or the number of people likely to be involved), some indication of the day(s) and time(s) you would like to book and a telephone number for contact purposes. Find out more about rooms available at West Kirby URC here.